Saturday January 29th 1898 It was a nice day and my company all came but Ed & Ada. We had such a nice visit and Mother helped me with the dinner so it was no trouble. Mother and I had all the dishes to wash after they went home. We visited all the evening. Sunday January 30th 1898 Will took the folks up to Stevens. I went over to see Emma and up to Stevens with John. He had been to Hill Siding and Will went over too with a team he sold for $185.00. He came after us and after supper him and Mother and I went over to Johns to spend the evening, calling at Emmas on the way over. 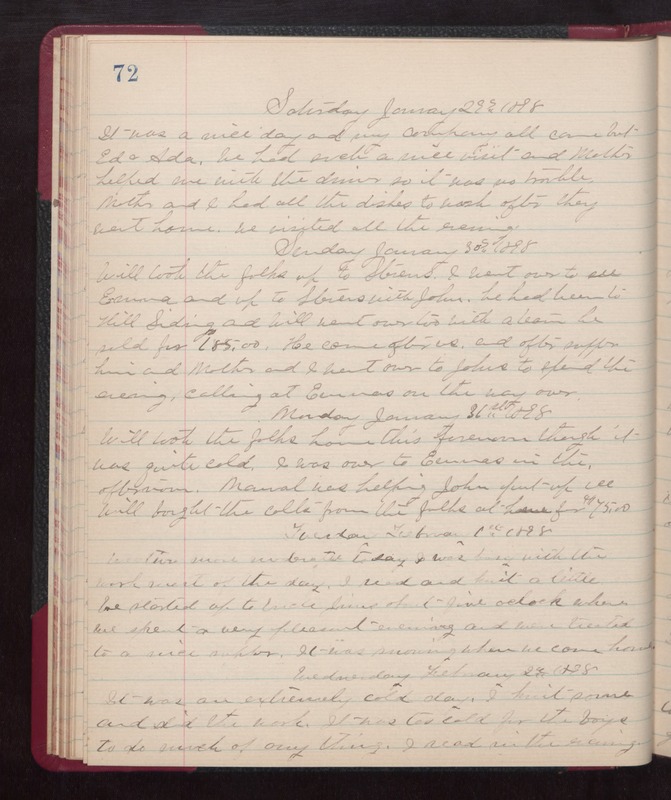 Monday January 31st 1898 Will took the folks home this forenoon though it was quite cold. I was over to Emmas in the afternoon. Manuel was helping John put up ice. Will bought the colts from the folks at home for $75.00 Tuesday February 1st 1898 weather more moderate today. I was busy with the work most of the day. I read and knit a little. we started up to Uncle Jims about five oclock where we spent a very pleasant evening and were treated to a nice supper. It was snowing when we came home. Wednesday February 2nd 1898 It was an extremely cold day. I knit some and did the work. It was too cold for the boys to do much of any thing. I read in the evening.